I sort of recall seeing a commercial for this stuff while in a drunken haze at about three in the morning. Other than that, I had no experience with it. So, when I stumbled on it while doing research for an article, I was quite surprised by not only the history of its creation, but also by how much vitriol many people harbor for it. Originally developed by injection-mold wheelchair manufacturer EdiZONE, Floam was not initially intended to be a toy. It was created to provide relief to wheelchair-bound patients who suffered from pressure-related sores that would form due to lack of movement. Floam, essentially a compound made of microbeads suspended in foam, could be form-fitted to provide a certain amount of comfort for the patient. Since its inception, Floam has been an element in various products, ranging from shoes to orthopedic support to-you guessed it-toys. Kind'a goes up in flames rather quickly, eh? 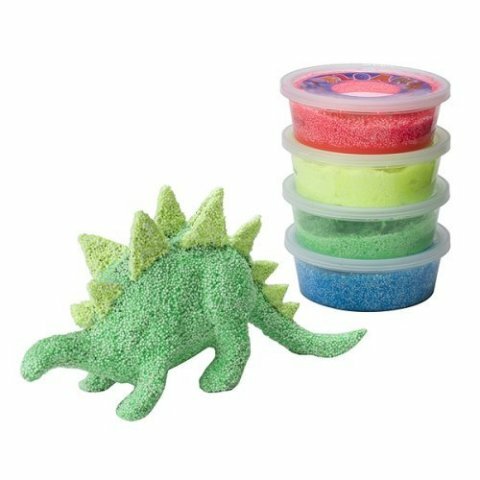 Flammability aside, Floam offers some unique fun for kids in that it can be molded into all sorts of shapes and allegedly can be attached to practically any surface without leaving residue. Plus it comes in all sorts of pretty neon colors. Ewwwwww!!! That is just plain nasty. Can you imagine a little kid running amuck with that on his hands? Consumer reviews of Floam aren't overwhelmingly positive. Complaints include Floam's propensity to grow mold to its overwhelming chemical scent (though it is non-toxic). Apparently consistency is a problem as well, with some containers being gooey and others being almost dry. From what I can gather, Floam needs to be kneaded for about fifteen minutes or so before it becomes workable. But when one consumer blatantly states that Floam is "the stickiest garbage in the history of the world," you may want to take heed. As an element in shoes or as a medical support product, I think Floam is a great idea. As a toy... Well, I sort'a agree with the kid's mock enthusiasm in the video. For a while Floam was only available via mail order thanks to informercials. Now it can be purchased online and in stores. So... if you're curious as to what all of the hate is about, you can purchase Floam at Amazon.com. SOURCES: Free Press Release Center & Wikipedia. 'Tweetstorm' Is Trademarked, So 'Timeline Colonialism' Is On The Rise? :( Doesn't really look like it just goes up in flames to me. Was that lighter fluid that he soaked it in before lighting it a second time? It actually looks like it's safe for all but the most pyromanic of kids. Yeah... could be lighter fluid the second time... I'll give ya that. But it lit up pretty nice that first time. In digging around I just found waaaaay too many unhappy people out there with this stuff. It looks kind'a neat to me, but seems very touch and go when it comes to product consistency--lots of complaints. I'm all for finding an alternative to certain putty toys out there--I just don't think this is it.